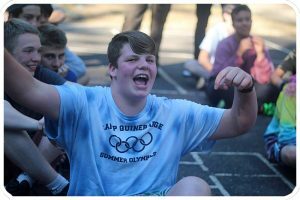 We are excited to kick off our new series, “Because of Camp I…” These essays are written by our campers about their personal experiences at Camp Quinebarge, and how being a Quinebarger has changed each of their lives. Because of Camp I …. Because of camp I have learned to live in the moment. I have been going to the wonderful Camp Quinebarge for three summers. In those 13 weeks total, I have made lasting friendships, learned how to make friendship bracelets, learned to ride horses, and raced chickens! Camp Quinebarge is the single greatest place I have been in my life. I remember on my first day, I was scared. The longest I had ever been away from my parents before camp was 4 days. I was going to camp for 4 weeks. I moved into my cabin, met the kids I was going to live with, and before I knew it, I had no more worries. Everyone at Camp Q wants to have fun and make friends. Why else would you go? Every moment there is someone there with you, cracking jokes, or laughing at you for accidentally falling off of the dock, or sitting there as you tell them things you haven’t even fully admitted to yourself. When the Camp Q website tells you that “Since 1936, Camp Quinebarge has provided a safe, fun and exciting environment for boys and girls ages 7-15 to learn about themselves and each other and make everlasting friendships,” it doesn’t explain the depths of those friendships. The friendships are so amazing, you feel like you are in a Disney movie. Still to this day, I keep in contact with those kids I met during my first summer. Now you might be thinking, “what the heck does any of this have to do with living in the moment?” I’ll explain. The worst part about camp is that you can’t live there forever. Once you show up, the faster you can move on from your fears about the food (It’s delicious. Trust me. ), or worry about IF you will make friends, and the sooner you can be yourself, and the faster you will make those Disney friendships. And the faster you will begin to love everything about Camp Quinebarge. Two weeks is both a lifetime and a blink of an eye. Yet somehow, once that two weeks is up, you will discover that you’ve become happier, and that you can only think about the next summer. I personally hate to think about the end of camp. When I stated earlier that “The worst part about camp is that you can’t live there forever,” It doesn’t even come close to bringing justice to how much I hate leaving Camp Q. For anyone that saw me on my last day this summer, I was laying on the basketball court, crying. The thought that you won’t get to return to the campfire songs, the waterfront, the horses, the culture, and of course, the people, for AN ENTIRE YEAR hurts. But that feeling of sadness, even if it makes your parents laugh at you a little bit, is proof of the greatest experience of your life. It’s impossible for me to give you the full power of the joy you feel at Camp Quinebarge through writing. The easiest way would be for you to come yourself.